File encryption is additional security you can apply to a workbook. 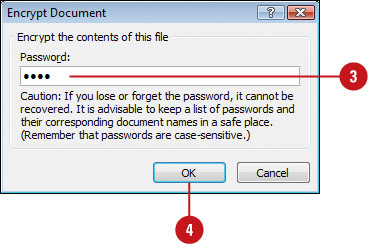 File encryption scrambles your password to protect your workbook from unauthorized people from breaking into the file. You don’t have to worry about the encryption, Excel handles everything. All you need to do is remember the password. If you forget it, you can’t open the file. Password protection takes effect the next time you open the workbook. To set password protection using file encryption, use the Encrypt with Password command on the Info screen, enter a password, write it down for safekeeping, and then reenter the password again. 2. Click the Protect Workbook button, and then click Encrypt with Password. You can remove file encryption. Click the File tab, click Info, click the Protect Workbook button, click Encrypt With Password, delete the file encryption password, and then click OK.